Inventors are really good at pattern matching, and we easily see how one thing is analogous to another. At the same time, a lot of innovation starts with the discovery of a new understanding of an old problem. Inventors often find themselves saying "We've been trying to solve a problem with regard to A, but we've already solved a lot of it with regard to B, and B is like A...." Innovation by analogy. ● Deference. The UI helps users understand and interact with the content, but never competes with it. ● Clarity. Text is legible at every size, icons are precise and lucid, adornments are subtle and appropriate, and a sharpened focus on functionality motivates the design. ● Depth. Visual layers and realistic motion impart vitality and heighten users’ delight and understanding. Imagine if politicians decided to write rules requiring that all voting systems follow those three simple rules. Deference to content, meaning that the user interface never gets in the way of voting. Clarity, meaning that the design is motivated by keeping the content clear and functional. Depth, meaning that the users are able to better understand what they are voting on. Another way to think about it is to ask yourself "if Steve Jobs were alive and in charge of setting up the user interface for democracy, what would it look like?" For one, he would fire anybody who tried to make it harder than it already is. He would insist that any authentication system cause as little trouble for users as possible. Once authenticated, he would want the authentication to remain valid as long as possible without requiring the user to re-authenticate every time. He would insist on voters being able to use their interface to democracy at whatever time and place is convenient to them. He would take steps to prevent fraud (just as Apple takes strong measures to prevent "Jail Breaking", or rooting of their phones), but he wouldn't cripple the entire ecosystem in the process. Everything has a user interface. Any time we have the opportunity to create or modify a user interface, we should be very aware of what we are doing. Don't make things harder to use. Don't add design elements just for the sake of showing off or making things harder. In fact, Apple's three elements of deference, clarity and depth may be all we need to create a much better world. General thoughts on the question "I have an invention and I want a patent ... what do I do?" So.... You have an invention. First things first: All patents require innovation, but not all innovations can be patented. Patents apply only to a subset of all possible inventions. Democracy is an example of a terrific innovation that would not be patent-eligible. The patent-eligibility line lies somewhere between obviously non-eligible innovations like representative democracies and obviously eligible innovations like the artificial heart. The first hurdle is whether your innovation is the kind of thing you can patent. Sometimes the answer is easy, but for a surprisingly large number of innovations, the answer is unknown. The language defining patent eligibility in the United States has been essentially unchanged for 220 years, yet the courts are still struggling to figure out where that line lies -- and the ongoing ambiguity is not one of precise line placement, but rather of where the line falls within a broad zone of ambiguity. (see Note 1 below and this article). The Supreme Court is taking another crack at figuring it out this year, and it remains to be seen whether we will have a better idea about where the line is drawn then (detail in Note 2 below) [UPDATE: Patent eligibility remains a murky area of law]. Until then, the best advice I can give you on subject matter eligibility is this: Stop trying to answer this question by searching online, because for a lot of inventions the answer is literally unknown. Hire a patent lawyer and just hope that the lawyer guesses right about what the law currently is and where it is going. The next hurdles are far better defined. The invention must be (1) useful; (2) novel; and (3) not obvious. Again, a patent lawyer is your go-to person for an actual answer. If, at the time you filed for the patent (note that it is no longer at the time you invented the thing), somebody skilled in the art wouldn't have found your invention obvious, and nobody else has actually made the thing already, you're in good shape. What if you can't afford a patent lawyer, or if you want to minimize your costs while you drum up investors (or think about the viability of the product, etc)? You can file a provisional patent application. A provisional patent application costs $130 (or in some cases $65) to file. It doesn't need to set out formal claims or follow most of the other requirements for formal patent applications. Thanks to a provision in the America Invents Act, it is critical that you file at least a provisional application as soon as possible. Even if you invent first, if a later inventor beats you to the patent office, they will get the patent and you won't (with some complex and rare exceptions that your patent lawyer can explain). A lot of the time people file provisionally without a lawyer, but doing so on your own does present some risk. In fact, while in some cases a provisional patent application makes sense, doing a provisional filing with or without a lawyer is not without risk (for example, if you use a provisional to postpone paying for a full utility application, you may find that your provisional application is missing some elements you later want to claim, and you might lose the priority date you think the provisional gives you). In some cases, particularly where there is a question about subject matter patent eligibility, you may be better off treating it as a trade secret. If you are ready to launch a product and want an issued patent ASAP, you might want to go with an expedited "Track 1" application. I know, to people outside of patent land none of that makes easy sense, but that alone is good reason to talk with a patent lawyer. That said, I'm not a patent lawyer (I'm a licensed California lawyer, but my patent work revolves around developing and patenting my own inventions), and I can tell you that nearly all lawyers who work with patents lack the holistic picture inventors need. Basically, you're not looking for a patent just for fun (or if you are, that is some expensive fun). Rather, it needs to fit into your business plan. You need to be aware of costs, timing, and ultimately how your patent prosecution strategy impacts your ability to later monetize your patent (for example, by keeping competitors from ripping off your idea). In the course of your patent's lifespan, you're likely to run into at least two legal requirements -- first, you need a lawyer to get your patent issued (yes, you can do it without a lawyer, just like you might be able to set your own broken arm without going to a doctor). That "patent prosecution" lawyer normally views the job as "get the patent issued". But a patent prosecutor doesn't know your business. Second, if you are lucky enough to get a patent that covers something valuable and unlucky enough that somebody else is ripping off your invention, you need a lawyer to enforce or license your patent (again, you can do it yourself, but it isn't easy to do it right). One thing that your patent prosecution team won't do for you is think through the actual use of your invention in a way that leads to additional claims, patent elements, etc. Remember that your invention is not going to stand alone. Rather, the invention will take its place in an ecosystem where additional functions or small adjustments may be critical to success. Don't limit your patent filing to what you think is the most likely implementation and use of your invention. The future can be forecast, but is unwritten. You can easily be surprised to find that something you considered a minor piece of your invention turns out to be the primary source of value in your patent. You are already sharing your invention and creativity with the world -- you might as well spend some extra time making sure you don't leave the invention half done. I should also point out that you have some enforcement choices. Please don't be a jerk about it. Some patent owners will threaten or sue individual end users of a product that is actually made by a bigger company. Technically, those individuals are infringing, but you should think long and hard about whether it is right to go after individuals and small family businesses before going after the entity that supplied them with the infringing product. Sometimes it makes sense, but it should be done only after giving a lot of thought to whether it is the right way to go about it. I know I said it a bunch of times already, but to reiterate: See a patent lawyer. Seriously. A seemingly tiny error in drafting can mean the difference between validity and invalidity of a patent. Note 1: The U.S. Constitution authorized patents ("Congress shall have the power... To promote the Progress of Science and useful Arts, by securing for limited Times to Authors and Inventors the exclusive Right to their respective Writings and Discoveries...", Art. 1, Section 8, Clause 8). The Patent Act of 1793 described the kinds of innovations eligible for patent protection very broadly: "any new and useful art, machine, manufacture or composition of matter, or any new and useful improvement on any art, machine, manufacture or composition of matter". The language in effect more than 220 years later is nearly identical: "any new and useful process, machine, manufacture, or composition of matter, or any new and useful improvement thereof, may obtain a patent therefor, subject to the conditions and requirements of this title". Note 2: Bear in mind that the Supreme Court normally determines what the language in the statute has always meant -- meaning that filing for a patent prior to the Court's decision is unlikely to make any difference. If the Court decides your innovation is not patent-eligible, the decision will apply whether you already hold an issued patent, whether you were previously on file with an application, or whether you have yet to file an application. Congressional changes to patent law (and yes, they're also likely to make some big changes to other parts of patent law) are different, and for those changes filing dates frequently matter. The heart of innovation is the moment that reorients your thinking. Everybody -- you included -- has always looking at something one way, and then you realize there is another way to see it. This short post is intended to provide two examples of things you can see differently. The post's title probably gives this one away, but let's rethink something really basic: Light. We know that light can be bright or dim, can be blocked to cast shadows, can occur in different wavelengths, and can be split into component wavelengths by a prism. Our thinking about light, though, includes one enormous assumption: We are big. From the perspective of something the size of a subatomic particle, light would be perceived in an entirely different way. There are a limited number of photons hitting a surface at any given time, and if we are small enough, we can go quite some time without being hit. Without even getting into the wave/particle distinction or how we define the size of a photon, we can easily see how light can be analogized to fog. When it is foggy, the entirety of the atmosphere doesn't turn into water; instead, there are many tiny water particles amid otherwise dry air. Similarly, when a surface is lit up with photons, there are large portions of the surface that are, at a given time, not being hit by photons. In other words, it's dark between all of these photons. Now imagine that I am standing on a flat surface pointing straight up. I then call you via video conference, have a friend show you what I'm doing, and ask you to point in the same direction I'm pointing. Most people would simply point up. There are many likely assumptions that go into this response, and the accuracy of each of them is critical to whether "up" is the right response. Note that I reference "likely" assumptions. Innovation is not about guessing the answer to a trick question, so we can forget about answers based on deception, such as imagining that I asked the question while standing in a giant centrifuge. Instead, look for things that reorient how you understand the question. Did you think about where I am relative to you? If I'm in Moscow and you're in San Francisco, "up" for me is "down" for you. In those circumstances, you should have pointed to the ground. Even if we're standing next to each other and Jupiter is directly overhead, I may point "in the direction of Jupiter", but the rotation of the earth is such that by the time you've pointed, you are probably off by a small amount. There is a concept in psychology called "fundamental attribution error". Wikipedia explains it as "people's tendency to place an undue heavy emphasis on internal characteristics to explain someone else's behavior in a given situation, rather than thinking about external situational factors". There is a similarity between fundamental attribution error and a failure to innovate. We try to answer the question we think has been asked, rather than taking a step back and making sure we aren't missing something crucial in the very framework in which the the question exists. Great innovations often happen when innovators realize that everybody else has been trying to answer the wrong question, or relying on incorrect assumptions in understanding the question. Project managers often use a "Cone of Uncertainty" to describe the possible range of project outcomes, length, costs, and other factors at a given point in time. A well known variant on this is the National Hurricane Center's "NHC Track Forecast Cone", which represents "the probable track of the center of a tropical cyclone ... along the forecast track (at 12, 24, 36 hours, etc.)." While the Cone of Uncertainty is commonly used to visualize the potential outcomes of events such as weather or projects, there is no reason it cannot be used to plan educational and career paths. Indeed, the Cone of Uncertainty model is one of the best ways to illustrate how important a broad knowledge base and skill set is to innovation. As I describe in my piece on "The Imposter Superpower", innovation requires that we know enough to know what is possible, but not so much that we internalize what "experts" think is impossible. Experts can explain how we think things work and why we think we cannot do certain things; innovators have a broader view, bringing together ideas from disparate fields to do what experts in each of those fields would have never imagined, or would have believed impossible. The cone of uncertainty, in the context of knowledge and innovation, describes what the putative problem solver believes he will need to know in order to solve the problems that face him in the future. Like all aspects of innovation, children start with a broad, creative view: "I can do anything, I can solve anything, so I need to be prepared to face anything." As we shuffle through the education system, we face mounting pressure to reduce the scope of our knowledge in order to allow us enough time to increase the depth of a subset of that knowledge. By focusing all of his energy on a single subject -- in this case, mathematics, the expert will undoubtedly have a far better grasp of the current state of human knowledge about mathematics. This firm grasp will include all of the errors and inaccuracies in current human understanding about mathematics, and all of the false limitations that flow from them. By contrast, the innovator, with a far broader (and far shallower) base of knowledge, knows enough to see the possibilities in many subjects, the cross-disciplinary solutions to problems, and other aspects of the "big picture". While the innovator's broader knowledge makes her the "visionary", she will often need to turn to experts to actually fashion and test the visionary solutions she comes up with. One can imagine how this plays out in practice. Imagine that the expert mathematician works for a government agency and is tasked with developing a formulaic method for breaking public key encryption (while it is thought that no such formula is possible, it has yet to be proven). Without a formula, brute force attacks require either an impossibly high amount of time on regular computers, or the development of a powerful enough quantum computer (the NSA is on it, though). Now imagine that the mathematician is not the only one working on the problem; the same agency has a group of programmers working on a classic computing algorithm that would crack the keys more efficiently and a group of physicists working on a quantum computer with enough processing capacity to instantly crack the encryption. What if there is a solution, but it requires an algorithm, running on a combination of a classical computer and a low-capacity quantum computer, within the framework of a mathematical formula that reduces the number of possible solution sets but falls short of a fully formulaic solution? 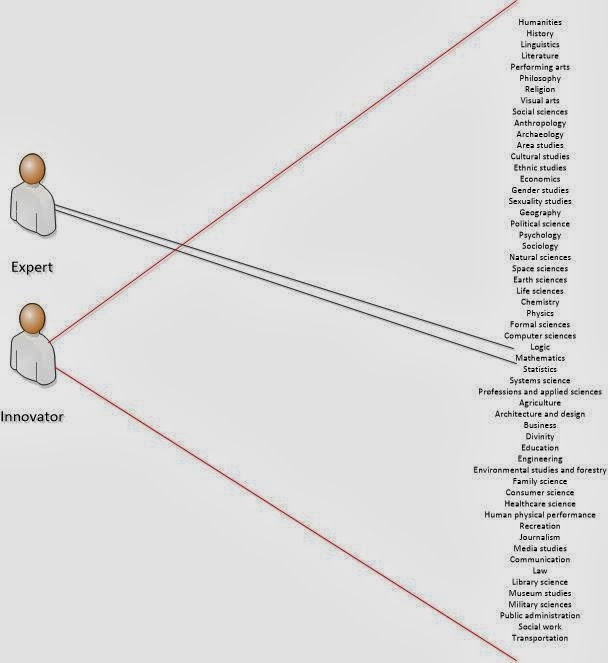 The innovator, with a little bit of knowledge in each of these areas, could shuttle between the three groups of experts and synthesize the solution. The innovator could never implement all aspects of the solution on her own, but implementation is what experts are for. The innovator starts with a broad knowledge base, combines ideas from experts in different fields, and creatively combines them into a likely solution. As the example shows, knowledge and expertise are not enough. Creativity is also required. As I've written, humans are born with unbounded creativity, but most people lose a lot of their creativity as they gather expertise and education. I was initially planning to describe a second cone-type mechanism for understanding creativity, but found the qualities of the "cone of creativity" essentially parallel the knowledge/experience cone of uncertainty. Humans are naturally creative, and as long as we keep a substantial breadth of knowledge easily accessible, our creativity in combining ideas sourced from diverse places along that breadth of knowledge remains strong. In essence, there is a strong correlation between creativity and maintaining a large knowledge/experience cone of uncertainty. One objection to keeping a large cone of uncertainty is that we sacrifice too much depth of knowledge in order to maintain familiarity with far too broad a number of subjects. This is true, and is the primary reason why highly focused experts are critical to scientific progress. A single human being cannot simultaneously be the world's leading expert in a narrow subject and a highly prolific innovator broadly knowledgeable across a range of subjects. But with billions of humans to draw upon, there is room for everything from the most diffusely knowledgeable innovator to the most hyper-focused expert, and as long as we are conscientious about pairing innovators with experts, we will innovate at a remarkable rate. The counterpoint to the objection that the cone of uncertainty is too large is that the universe is uncertain. We may think we know what problems we will face, but even the best forecasts can be disastrously wrong. While an imperfect analogy, the sample cone of uncertainty (near the top of this article) is a good illustration. It is a forecast cone for Hurricane Katrina, a storm that caused incredible damage to New Orleans. 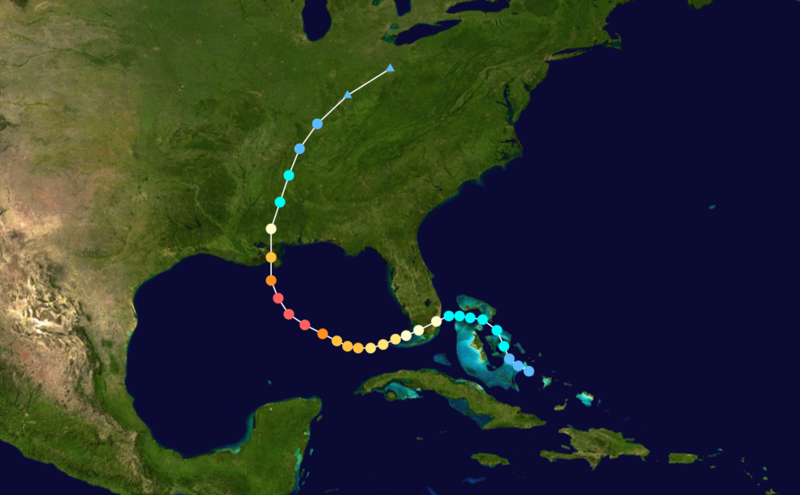 The forecast cone was issued at 11:00 am EDT on Friday, less than three days before the 7:10 am EDT landfall in Louisiana, but showed New Orleans barely at the edge of a far side of the cone. 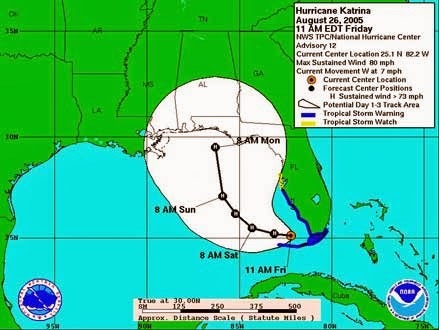 At 68 hours prior to landfall in New Orleans, the most likely track for Katrina took it right into Florida's panhandle, with Alabama and Mississippi between it and New Orleans. As it turns out, the actual track was quite different from the forecast track. Katrina's forecast track did at least include New Orleans as a lower probability target at the far edge of the track. The actual point of landfall for storms is frequently outside of the track -- the National Hurricane Center's forecast cone attempts to accurately predict the path around 60-70% of the time. Given the substantial consequences if emergency planners do not prepare for the risk that the cone of uncertainty is too small, planning is done for potential landfall targets all across the track, and even outside of the track. If emergency planners in the field of hurricane tracking are analogized to innovators and experts in the field of problem solving, we see why it is important to plan for problems that arise outside of the predicated cone of uncertainty. The bottom line is that innovators need to think more like DaVinci -- art may seem unrelated to medicine and aviation, but if you study DaVinci's work, you will see the important role his skills as an artist played in studying medical and aviation problems. In the days before the FAA, degrees in art history and homogenized medical education programs, it was easy to learn about a broad enough swath of subjects to accommodate an enormous zone of uncertainty. It is still easy -- we have simply forgotten how important it is to have broadly knowledgeable innovators.